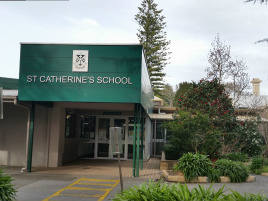 St Catherine’s School, Stirling is located in the picturesque Adelaide Hills. The school was founded by the Dominican Sisters and promotes excellence in every dimension of a child’s life, with special emphasis on the faith formation of students and their families in the Catholic tradition. St Catherine’s School caters for students in Reception to Year 6. We endeavour to develop rich, contemporary learning environments that are personalised, relevant and challenging. The school has a strong arts program, playgroup and OSHC service, along with a committed and supportive parent community. Specialist areas include physical education, Italian and an active music program. We respect and care for our earth and acknowledge that we are all called to be ecological leaders. The environment and sustainability are areas of focus in our school. St Catherine’s has a three pond wetland system which the students manage through planting, weeding and mulching. We have a permaculture garden, water tanks, bokashi composting bins, solar panels, chickens, worm farms and an aquaponics system. St Catherine’s strength lies in the evidence of enriched learning experiences for children. It is highlighted by the fellowship achieved in a small, happy, enthusiastic school community where we have the opportunity to develop close and lasting friendships. Informed by our Dominican heritage, we are hope-filled and futures-focused.